JMT is a family-owned company that has been in operation for two generations. With over 40 years of experience as a master supplier of metal fabrication equipment, JMT is dedicated to servicing its customers. When you purchase equipment from JMT, you’re buying more than just machinery, you’re buying our knowledge and dedicated customer support. JMT service begins before you purchase any equipment with our site assessment consultation. In addition to reviewing your fabrication requirements, we will also audit your production area to make certain the equipment you purchase will work well in your manufacturing environment. We look at where the equipment will be placed on the production floor and how it will be brought into the facility. We make certain that your foundation provides proper support for the equipment and that there is adequate sources for electrical, pneumatic or hydraulic power. We look at the surrounding equipment to assess if there are any electro-magnetic or vibration interference issues. We also can advise you on material handling and work-flow issues. Optionally depending on the equipment you choose, a JMT service technician can come to your site and install your new machine for you. The technician will calibrate the machine to standard performance specifications and test the equipment. During this phase, our technician works closely with your machine operators to train them on the equipment using your actual production parts. Generally our technicians spend 3 days on-site for installation, testing and training. 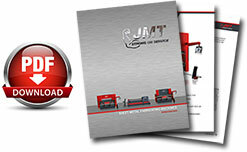 JMT machines are made to our stringent specifications so they are highly reliable. Should you need parts or service, worldwide network of JMT distributors and technical support personnel are in place to assist you. We do all of these things because JMT prides itself on customer satisfaction.